Guided meditation for sleep tracks are here for your benefit when you are facing challenges in getting quality sleep. Whether your challenge is due to insomnia or something else, these will aid you to become calm and flow into a frame of mind that is totally relaxed. Exactly what you need for actually falling asleep and attaining a quality nights rest. Good sleep is critical to your health in so many ways. Sleep deficiency has been shown to alter activity in various parts of the brain in various studies, leading to issues such as trouble making decisions, problem solving, controlling your emotions and behavior, and coping with change. Along with other studies linking it to depression, suicide, and risk-taking behavior. Lack of sleep induces stress and the production of cortisol, something which inhibits cognitive ability and can also lead to the various things mentioned before. Plus it is very bad for your physical health too. You can discover more on all that via the NIH. The guided meditation for sleep “Deep Calm” led by Stephen Frost was developed to aid listeners in getting past the issues that prevent them from getting quality rest. There are various issues, usually related to stress, anxiety and/or depression which cause issues such as insomnia. Through taking time to meditate with this incredibly restful piece you aid yourself to move beyond those issues, carrying your own mind to a point of peace and calm that allows you to sleep with greater ease. 30 minutes 02 seconds. Whilst the guidance you flow through led by meditation master Stephen Frost is highly effective in itself there is a lot more within each track. The music itself has been developed and blended to match the energy, flow and intent of the piece too. Gently aiding you to slide deeper and deeper with each breath as your conscious mind flows along with Stephen. Though even the music has more to it. As a measure to aid you in overcoming the issues such as stress, anxiety and depression which are linked to trouble sleeping certain Solfeggio frequencies have been included. These are special harmonics which work on an unconscious level and help you to release tension, negativity and other things in the background which are affecting your ability to sleep. As you flow along through the meditation these Solfeggio frequencies help you to flow into a calmer and more peaceful state. By choosing the option for Delta wave music you can help yourself in an even greater way. By using brainwave entrainment attuned to Delta brainwave frequencies you are including something which will help your brainwaves come into syncronization with a state that is associated with deep sleep. This is a very good thing to aid yourself with, it increases the power of everything else mentioned before and with Delta being challenging to access for most people gives you an easy route into it, the option for deeper rest and the healing which comes with it. Making it one of the best natural sleep remedies and a great alternative to over the counter sleep aids. Going natural is far better for your health, and using the power of you mind through music and meditating is incredibly healthy. These are for whenever you need to sleep. For most people this will be at night, for others doing things like shift work this may well be during the daytime. Whatever time you are needing to sleep these tracks will help you to drift off in a very peaceful manner. To achieve the best with them do everything you would before going to bed first. Go through the cycle of washing, cleaning your teeth, and whatever else you do in your pre-bedtime routine. Then ease yourself into bed and get comfortable. You can use either speakers or earphones for this. If you are using earphones then ensure they are ones that you can be comfortable sleeping with, in some ways using speakers is easier as they will allow your ears to achieve a greater level of comfort as your drift off. Choose which ever is going to be best for you. Then set the sleep function on what ever mp3 player you are using to turn the device off just after the track finishes, press play, and just flow with the soothing instructions. You will find the soft vocals and gentle music lull you off into good rest in a truly pleasant way. The root cause behind many sleep issues is stress. As such achieving quality stress relief on a regular basis is something that will make it easier for you to actually get the rest you need. Stress is a root cause of many health issues, and meditating helps to relieve it and elevate your health in a wide variety of ways. Check out the benefits of meditation and you will find the various positive ways in which it can help you change you life and enhance it wonderfully. Regular meditating helps you to release stress and feel greater ease throughout your life. If you have been experiencing issues with it, due to work, money, family or other issues then taking time to meditate on a daily basis will help you in a big way. As well as using one of the specially developed guided meditation for sleep tracks above at bedtime, use one of the special meditation videos on this site at lunch time, after your finish work or at another time during the day. They will aid you in getting quality stress relief. Doing so will help you to change your life in a wonderful way. Done in combination this will help you achieve deeper rest and awaken from it feeling far more refreshed too. 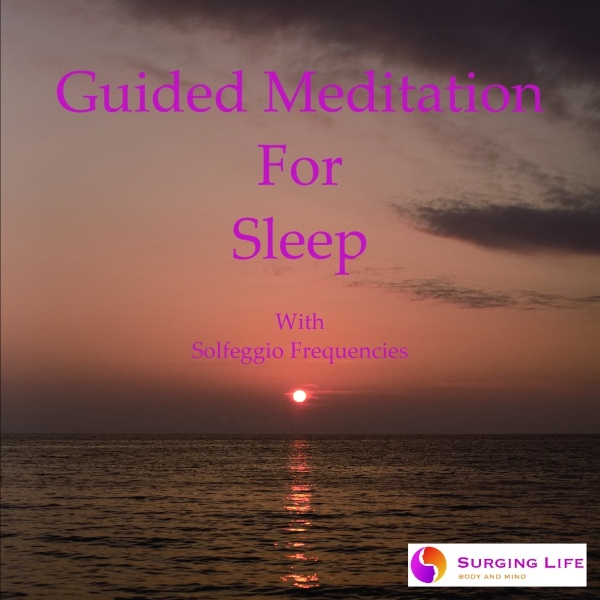 You can also use the special SurgingLife meditation music for sleep if you wish.